Mr. Goldberg recently obtained a Not Guilty verdict after a two week jury trial in Queens for a defendant charged with Criminal Possession of a Weapon in the Second Degree. Together with his co-counsel, Mr. Goldberg was able to convince the jury that there was a reasonable doubt that the gun in evidence at trial was the same gun that defendant admitted to possessing when he testified before the Grand Jury [on the advice of another attorney]. Mr. Goldberg recently secured a dismissal for a client who was charged with Unlawful Surveillance. The defendant had been videotaping people walking on a public street in Manhattan. Mr. Goldberg successfully argued that the video tapes showed that at no time did the defendant violate the statute or otherwise engage in any unlawful conduct. Mr. Goldberg recently secured a non-criminal disposition for a client who was arrested at John F. Kennedy International Airport when a handgun was found in his carry-on luggage. Mr. Goldberg persuaded the District Attorney that the gun, lawfully licensed outside of New York City, was inadvertently brought to the airport. Mr. Goldberg recently secured a non-criminal disposition for a client who was arrested in upper Manhattan for possession of a handgun kept in the trunk of his car. Mr. Goldberg persuaded the District Attorney that the defendant, who had a license to carry a firearm outside of New York City, had entered Manhattan on a business emergency and was in transit back to Westchester. Mr. Goldberg recently secured a noncriminal violation for a client who was charged in a high-publicity Enterprise Corruption indictment in Queens County. The charges, which carried a mandatory jail sentence of up to 25 years, were resolved with a plea to a Disorderly Conduct, a Conditional Discharge, no jail and a forfeiture of money seized at the time of arrest. The record of the conviction will be sealed after one month. Mr. Allen recently settled a case of a 70-year-old doctor who was falsely arrested and indicted for insurance fraud. The doctor spent one day in jail and the case was dismissed one year later. As a result of the false prosecution, the doctor suffered severe financial and psychological damage. In 2010, the City settled all claims for $300,000. Mr. Allen recently settled a case of a 46-year-old inmate at Rikers Island whose complaints of eye pain were not treated in a timely fashion and resulted in the loss of vision to one eye. In 2010, the defendants settled all claims for $310,000. Mr. Goldberg recently settled a case involving the vicious beating of a man being arrested on a minor drug charge. The plaintiff required emergency surgery to remove a portion of the lower bowel which will permanently affect his digestive system. Plaintiff spent nearly three weeks in the hospital. In 2010, the City settled all claims for $650,000. In a case that received national attention, a settlement of $340,000 was reached in a Federal lawsuit against the City of New York for the false arrest and imprisonment of an autistic man on charges of murder. Gerald Allen obtained the settlement for Ozem Goldwire who was charged with the murder of his sister. Mr. Goldwire was forced into a false written confession after 21 hours of interrogation and spent just over one year in jail before the case was dismissed. A verdict of not guilty on a charge of Driving While Intoxicated was obtained by Jay K. Goldberg. The prosecution introduced evidence that while driving the defendant collided with another car, that he had the smell of alcohol on his breath, that he was unsteady on his feet and exhibited other signs of intoxication. Through skillful cross-examination, Mr. Goldberg established that there were noncriminal explanations for the signs of intoxication and that defendant’s conduct while with the police demonstrated that he was not intoxicated. A verdict of not guilty on charges of Robbery and Burglary, arising from a Christmas Eve home invasion robbery was obtained by Jay K. Goldberg after a one-week trial. The prosecution introduced a surveillance video of the purported robbers and the testimony of two eyewitness victims identifying the defendant. Mr. Goldberg successfully demonstrated that the prosecution was misinterpreting the images on the videotape. More importantly, through skillful cross-examination, Mr. Goldberg was able to show that the identification of the defendant as one of the robbers was unreliable. The prosecution had offered JG a plea to 15 years in prison; the jury returned a Not Guilty verdict on all counts in less than an hour and a half. A settlement was reached in a Federal lawsuit for the use of excessive force by members of the New York Police Department. Jay K. Goldberg obtained $215,000 for S.A. whose ankle was severely fractured while being placed under arrest at a Brooklyn subway station by Transit Officers. Drug charges resulting from a seizure made pursuant to a search warrant were dismissed as a result of a motion brought by Jay K. Goldberg. By carefully researching the issues, Mr. Goldberg was able to convince the court that the charges were insufficient as a matter of law. As a result, the case was dismissed and the client was saved the cost and risk of a trial. A verdict of not guilty on charges of Burglary was obtained by Jay K. Goldberg after a four-day trial. The prosecution introduced a videotape of the burglary as well as an alleged confession by the defendant. Mr. Goldberg successfully convinced the jury that the person in the video was not the defendant and that the officer who testified as to the confession was an unreliable witness. A verdict of not guilty on charges of Driving While Intoxicated was obtained by Gerald Allen after a four-day trial. The prosecution introduced evidence that the defendant’s alcohol level was more than twice the legal limit. Mr. Allen skillfully and successfully cross-examined two expert witnesses to establish that the alcohol test was not reliable and that the police evidence of intoxication could not be true. Jay K. Goldberg obtained the dismissal of drug possession charges resulting from a search warrant seizure. In People v. Maley, Queens County, Mr. Goldberg convinced the court that as a matter of law all charges against the defendant had to be dropped. 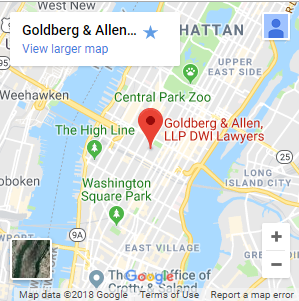 Jay K. Goldberg, of GOLDBERG & ALLEN, LLP, files suit against the City of New York for the multiple arrests, over a period of four years, of a person whose name is the same as a fugitive. Despite NYPD records showing that the fugitive had died 10 years before his client’s arrest, “the officers took no steps” to have the warrant removed from the system. Jay K. Goldberg, of GOLDBERG & ALLEN, LLP, obtains $350,000 settlement from the City of New York, for assault of a retired U.S. Customs narcotics agent during the execution of a search warrant at the home of his children. Jay K. Goldberg, of GOLDBERG & ALLEN, LLP, files suit against the City of New York for the multiple arrests of a man whose identity had been stolen by a fugitive. Despite being held for 16 days on two separate occasions, and receiving a letter from a judge that he was not the person wanted, the police continued to arrest the man based on the mistaken identity. Gerald Allen, of GOLDBERG & ALLEN, LLP, successfully defends client in DWI prosecution by demonstrating that police officer perjured himself in testimony about arrest. Through investigation and cross-examination, Mr. Allen was able to show that the officer’s testimony was a lie. Jay K. Goldberg, of GOLDBERG & ALLEN, LLP, obtains not-guilty verdict on all charges against a Brooklyn man, charged with the murder of his 4-month-old baby. The defendant, a deacon of his church, had been accused of punching the baby in the stomach thereby causing a rupture in the abdominal lining. Mr. Goldberg was able to demonstrate that the fatal blow may have been delivered by someone else, that the defendant’s attempts to resuscitate the infant may have caused the rupture and that the infant died as a result of negligent medical care. Jay K. Goldberg, of GOLDBERG & ALLEN, LLP, successfully defended a 20-year-old woman against charges that she murdered her newborn infant. As a result of the conviction on the lesser charge, the defendant was sentenced to probation instead of the life imprisonment that would have come with a murder conviction. Through cross-examination of the Medical Examiner and the presentation of expert testimony, Mr. Goldberg was able to establish that the newborn baby’s lungs were so severely damaged at birth that it could not have survived. Gerald Allen and Jay K. Goldberg, of GOLDBERG & ALLEN, LLP, successfully represented two NYPD officers before a Brooklyn Grand Jury investigating the shooting death of an unarmed murder suspect. The man, who had been told to place his hands on the steering wheel of his car, instead lunged for an object which appeared to be a handgun.